It’s often overshadowed by Kyoto, but a day trip to Nara is a must if you want to see the best of Japan. My jaw dropped as I walked from temple to temple in Nara Park. Buddhist temples, Shinto shrines, and more than thousand deer strolling freely in the park: Nara Park took my breath away. 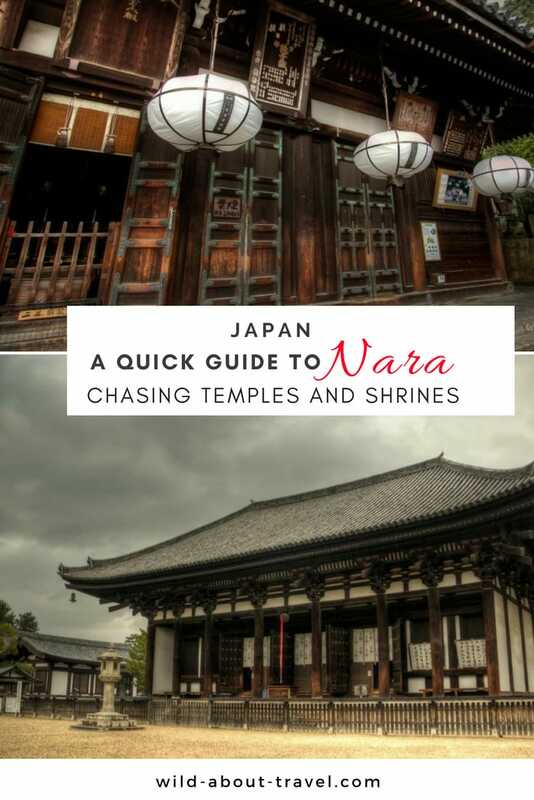 Founded in 710 A.D., over time Nara’s development was strongly affected by influences from China and Korea, and the city soon became the cradle of future Japanese culture and architecture. 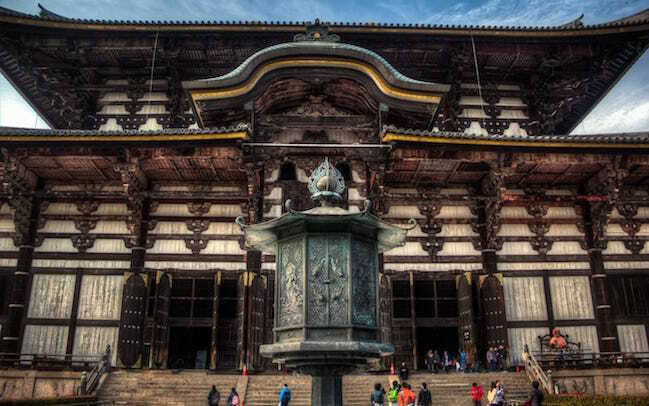 Unlikely many cities of Japan, ravaged across the centuries by earthquakes and fires, many historical buildings in Nara survived time, wars and natural disasters. Today, they are one of the most stunning ancient architectural complexes in Asia, a site whose beauty will stick in my memory forever. A day trip to Nara is a must if you want to see the best of Japan. 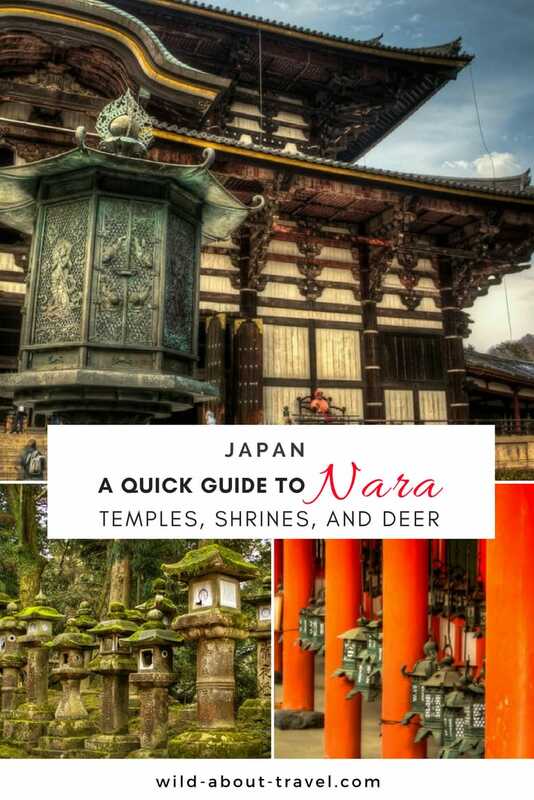 The lovely natural setting of Nara Park hosts some of the most beautiful ancient temples and shrines of Japan, and their exceptional beauty and architectural perfection owed them the inscription as a UNESCO World Heritage Site. 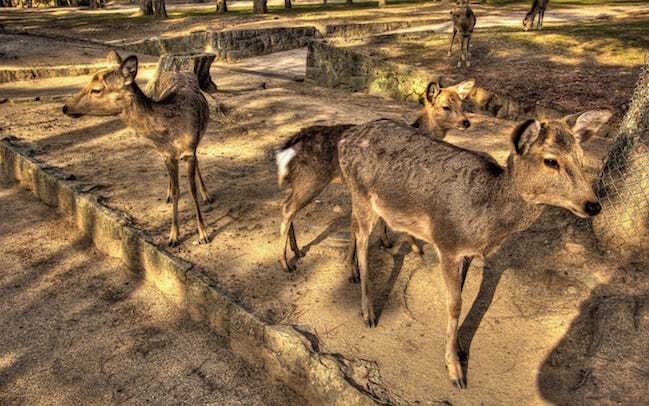 Like Miyajima, Nara is also famous for the tame deer roaming in the park (and sometimes in the city as well). Considered divine messengers according to the Shinto doctrine, the deer welcome the visitors, especially when offered the biscuits sold by the vendors scattered all over the park. I confess that I’m not much into feeding animals, but I appreciate that at least the “Shika sembei“, as the ‘deer-biscuits’ are called, are a good way to keep the deer’s health under control. Walking Nara Park was a string of surprises: as soon as I thought I had just seen the most magnificent architectural piece, I came across another one as stunning as the one before. Every temple and shrine is breathtaking in its way, and altogether they make for an impressive ensemble of ancient Asian architecture. Retrospectively, maybe the ‘less impressive’ (in relative terms) was the Kofuku-Ji Temple and the annexed five-storied pagoda, dating back to 1426 A.D. and the first building you meet entering the park arriving from the train station. The grey and overcast sky probably didn’t help, and I wonder how I would have felt had I seen the temple during a sunny day. I continued my walk across the park, surrounded by deer peacefully grazing in the woods until I reached an enchanting path fringed by a myriad of stone lanterns (more than 3,000, as I found out later). The way, immersed in the verdant forest, looked like the road to heaven and somehow it was, as I realized once I faced the Kasuga Taisha Shrine. 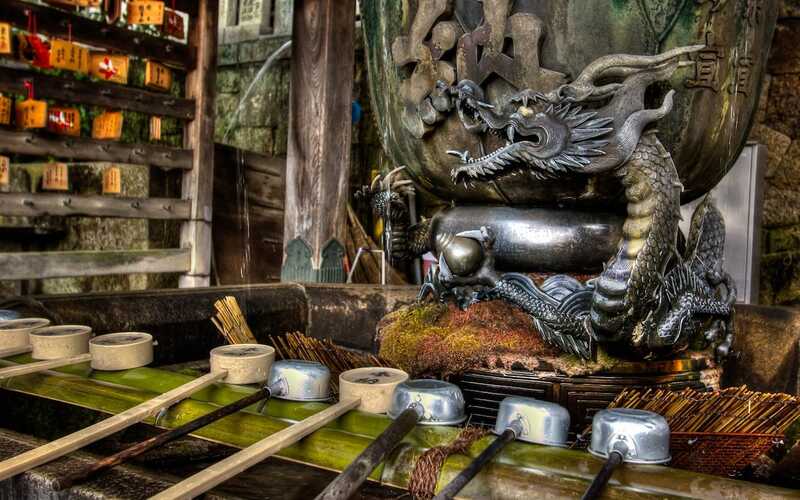 Founded in 768 A.D., until 1863 the Kasuga Taisha Grand Shrine was rebuilt every 20 years – however, keeping its original structure – to follow the Shinto concept of purity. 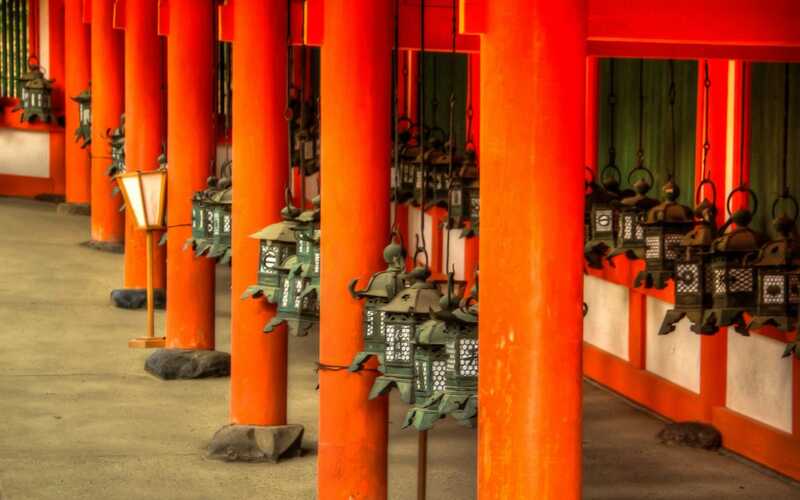 Not surprisingly, it is one of the most famous Shinto shrines in Japan, with its sloping roof, the vermilion columns and the hundreds hanging bronze lanterns. In the past, the lanterns used to be lit every night, but now this happens only a few times during the Lantern Festival in early-February and mid-August. 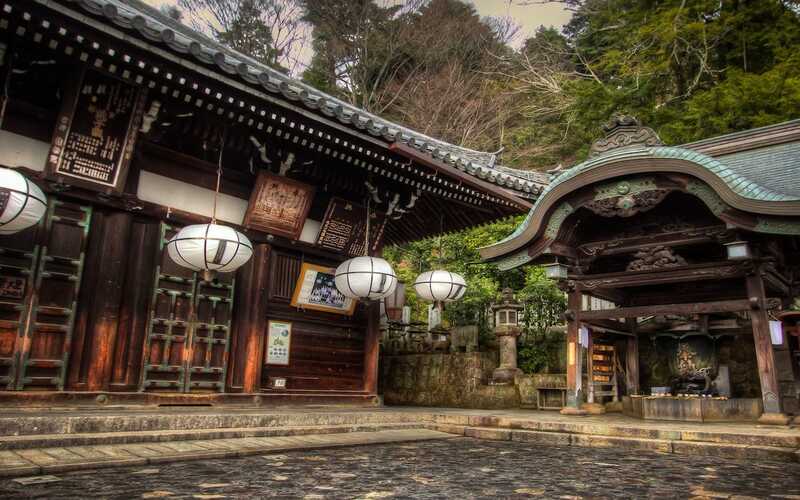 I could only try and imagine how mesmerizing the Kasuga Shrine must be at night, with its over 3,000 lanterns lit up, offering an incredible vision of shadows and lights, and I wish I had been there at the right time. 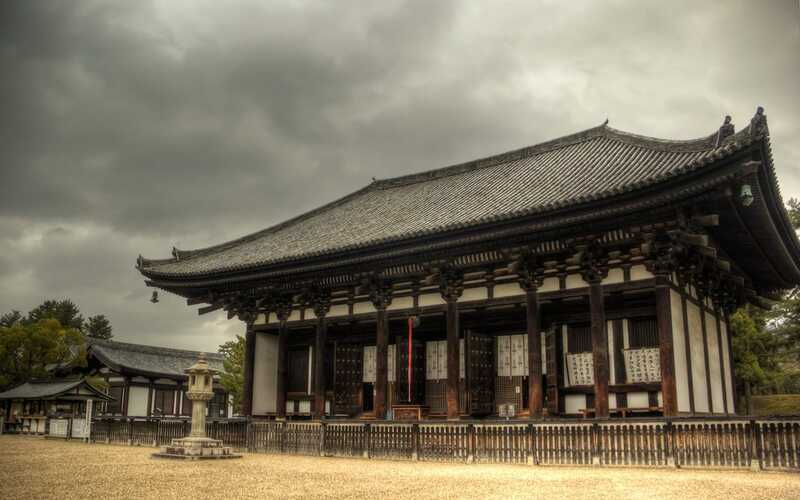 Barely mentioned in the guidebooks, the Nigatsu-Do Hall was one of my favorite spots in the amazing Nara park. Barely mentioned in the guidebooks, the Nigatsu-Do Hall was one of my favorite spots in Nara Park. Another walk and another marvel: the Nigatsu-Do Hall, or the ‘Hall of the Second Month’, part of the beautiful Todai-Ji Temple complex, the largest wooden monument in the world. Most visitors rush to visit Todai-Ji and the impressive Great Buddha statue, often overlooking the nearby Nigatsu-Do Hall. 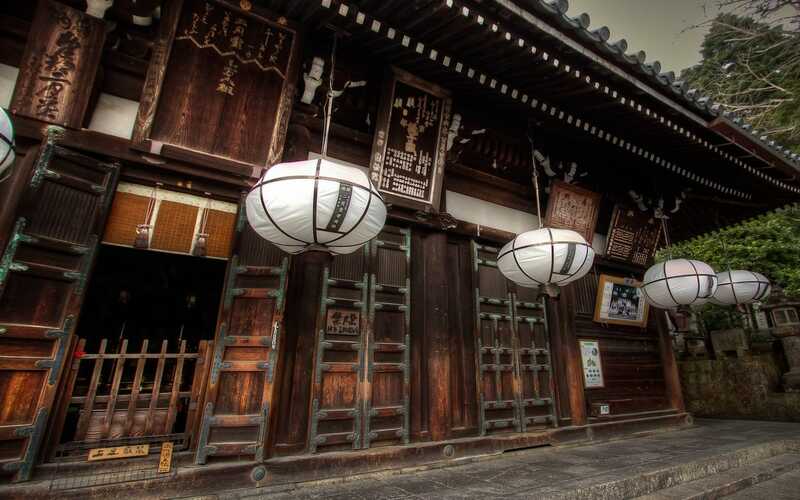 Barely mentioned in the guidebooks, Nigatsu-Do Hall is a beautiful wooden building, finely decorated with wooden carved panels and big white lanterns. 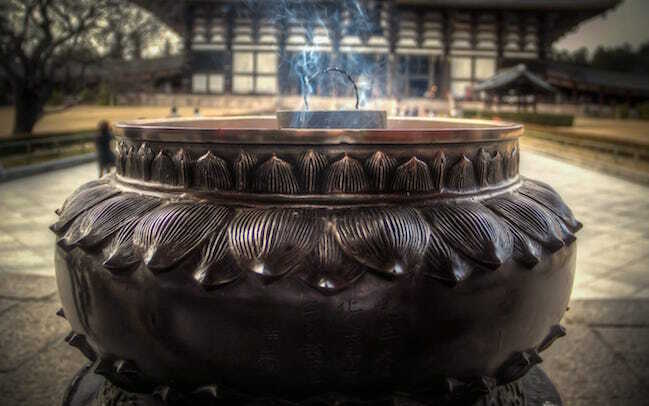 The purification fountain with the dragon is one of the most beautiful in Nara and the front of the hall, with the bronze lanterns swinging from the ceiling and the terrace overlooking the park, is one of the most enchanting spots in Nara Park. When I arrived in the late afternoon at first I was the only one and, for a few minutes, I could almost feel the sense of peace and spirituality emanating from this sacred place. Down the hill to the Todai-Ji Temple, bustling with people from all over. How could it not be? 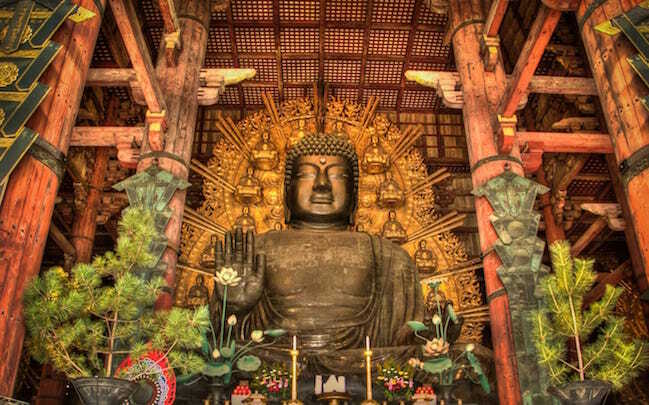 Todai-Ji is the most extensive wooden building in the world, hosting the Great Buddha Vairocana, the biggest bronze statue worldwide. All this is all the most impressive considering that the original temple – dating back to the 8th Century and repeatedly damaged or destroyed by earthquakes and fires – was even more massive, as was the statue. 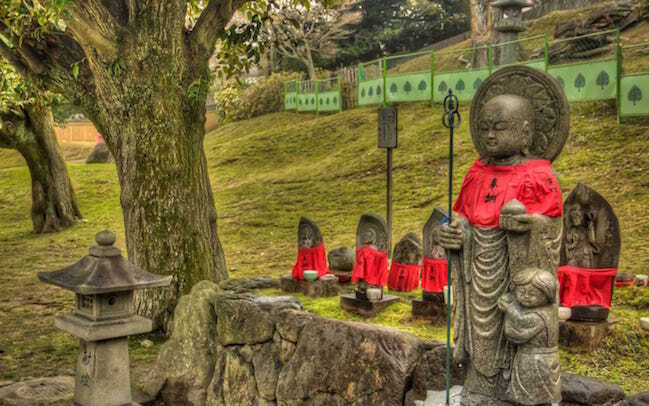 The charm of Todai-Ji goes way beyond its size and the Buddha Statue. The temple enshrines beautiful sculptures of guardians and Enlightened Beings and the external architecture showcases exquisite details, starting from the wooden roof, or the finely decorated bronze lantern facing the entrance, one of the few treasures from the original building that survived natural disasters. All of a sudden, I realized that I had spent hours in the fantastic Nara Park, and I could have stayed longer if only the temples weren’t closing so early. Time to take the train back to Kyoto, relishing with the images of an extraordinary ancient site. 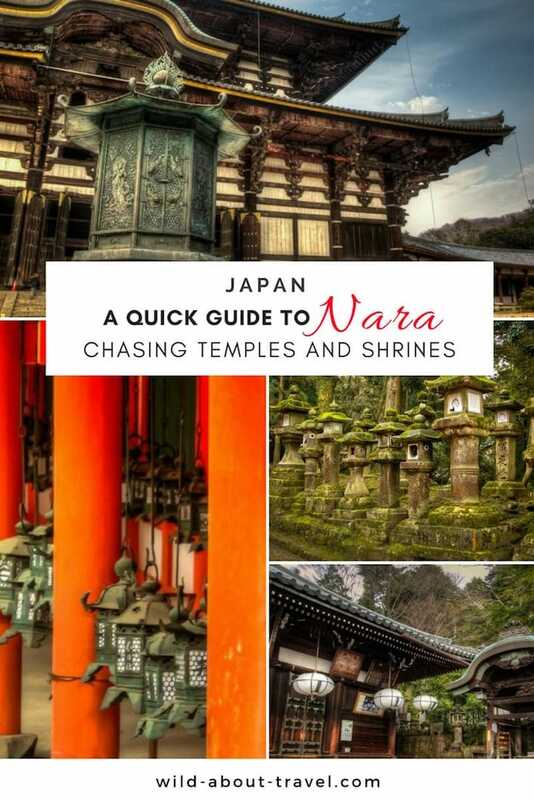 You can comfortably make a day trip to Nara from Kyoto (42km / 26 mi) and Osaka (32 km / 20 mi). ♦ From Kyoto to Nara: Japan Railways connects Kyoto Station to Nara JR Station by rapid trains (twice per hour, journey 45 minutes, covered by Japan Rail Pass). An alternative option is taking the Kintetsu Railway from Kyoto Station to Nara Kintetsu Station (frequent limited express and express trains, journey 35/45 minutes, not covered by Japan Rail Pass). ♦ From Osaka to Nara: Japan Railways connects Osaka JR Station to Nara JR Station by frequent rapid trains (journey 45 minutes, covered by Japan Rail Pass). Alternatively, the Kintetsu Railway connects Osaka-Namba Station to Nara Kintetsu Station (frequent limited express and express trains, journey 30/40 minutes, not covered by Japan Rail Pass). Traveling by train to visit Japan is very common, but navigating the many tickets and Japan Rail Passes options can be puzzling. You may want to read my article on How to Travel by Train in Japan. ♦ Stop by the Tourist Office right outside Nara JR Station to ask for a map of the city and advice on the best walking tour of Nara Park. When I was there, the staff was excellent and spoke decent English, providing useful information on the city. ♦ Nara Park is 15-20 minutes walk from the JR Station, but you can also opt for a bus or taxi ride. ♦ Wear comfortable shoes for Nara Park is enormous and you’ll walk a lot. Envisage a full day off to take your time enjoying the temples and the park, where there are many lovely spots where to stop for a little rest or a picnic. I visited Nara as a day trip from Kyoto, but honestly, I wish I had spent the night. Here are a few places where I would stay when I go back (because one day I’ll pay another visit to beautiful Japan!). If you fancy experiencing a stay in a Ryokan (the Japanese guesthouses), you may want to look at Kotono yado Musashino. Located on the edge of Nara Park, this Ryokan offers a wide array of amenities (kimono, onsen, and more), and is an excellent choice for couples looking for a romantic and unique stay. Find out more or book here. 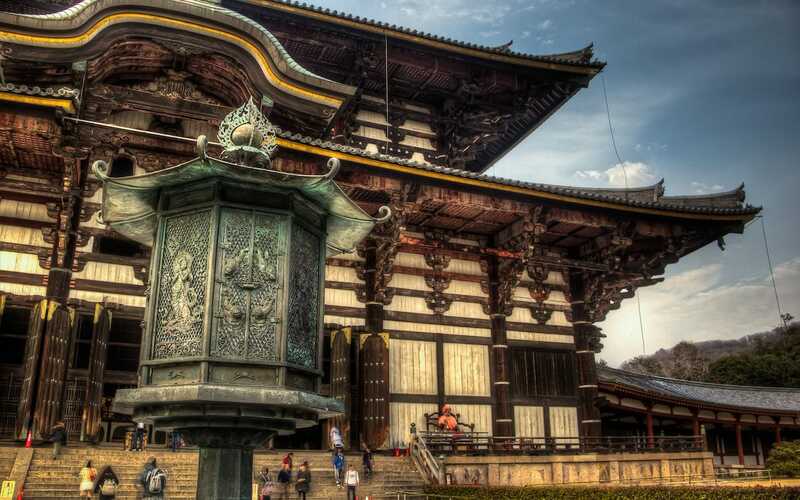 ♦ Big Buddha, Bambi, and Backstreets Cultural Tour: an English speaking guide will lead you through Nara Park to discover the most beautiful temples and shrines. Find out more here. 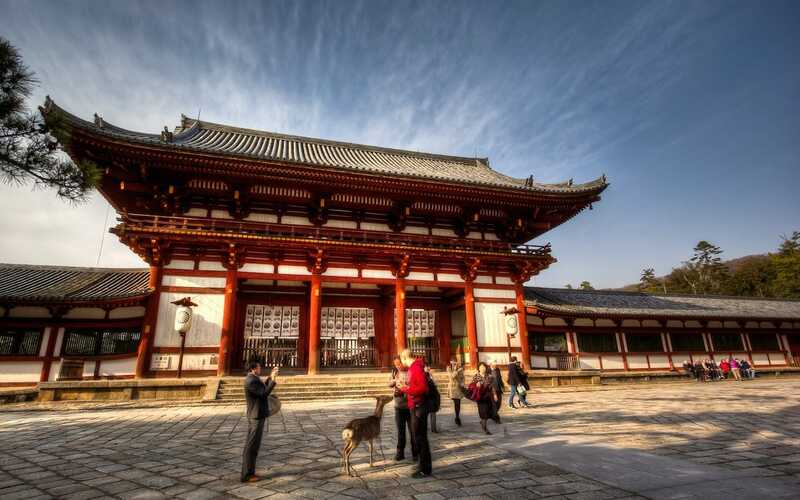 ♦ Kyoto and Nara – Full-Day Sightseeing Tour: if you are spending in Japan only a few days and want to get the most of your time, this might be the right tour for you. 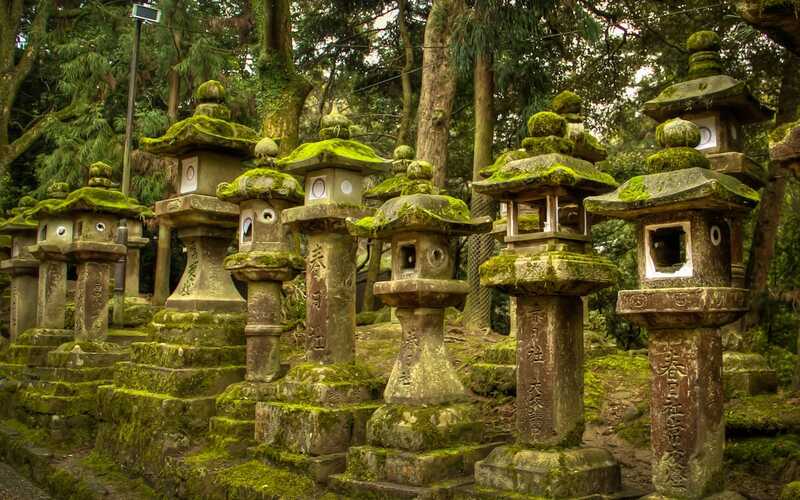 A full day to discover some of the best sites of Kyoto and Nara. Both cities are wonderful and would need much more time to explore all their beauty, but at least this tour will give you a taste of some of the most beautiful spots in Japan. Find out more here. Also try to see the Nara National Museum located inside the park. It displays Japanese Buddhist art and other exhibitions. Good tip! Thanks for that, Giovanni.